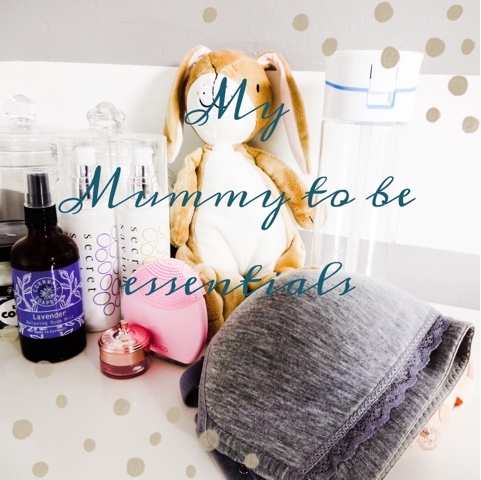 I’ve been inspired by the lovely Megan at www.seekmyscribbles.com to share my pregnancy essentials. I got to meet Megan at a bloggers event last year and it was lovely to discover that she was expecting a baby boy shortly after I also found out I was as well. I’ve really been enjoying her posts about all the baby stuff she’s collecting and how she’s finding it. So, I’m now at 37 weeks, definitely on the home run. My hospital bag is packed, the nursery is completely set up and I’m getting more excited by the day imagining finally bringing my little son home. My bump is pretty huge now but luckily I haven’t developed any stretchmarks so far, and that’s down to using this system. Secret Saviours works by combining a day cream and a night cream for your bump with a special supportive band that you wear. Its very comfortable and I really enjoyed the extra support the band gives. The creams both smell really gorgeous – the day cream has a slightly herbal smell and a sticky consistency that helps the pads on the inside of the support band adhere to your skin. The night cream smells of wonderful aromatherapy oils and feels very cooling and luxurious. I’ve loved the little nightly ritual of having Seb run it into my bump, it’s a nice bonding experience as well. The set is superb and my skin has remained very smooth and line free throughout, so I’d highly recommend it. A full review of the kit is available here. One thing hormones can certainly do is mess with your skin, not to mention all the sleepless nights (oh yes, there seem to be plenty of those BEFORE baby, even though ironically everyone keeps telling you to gets lots of sleep while you still can). I’ve always had quite normal skin, but I started to notice I was getting a few breakouts, and this little device has really helped. 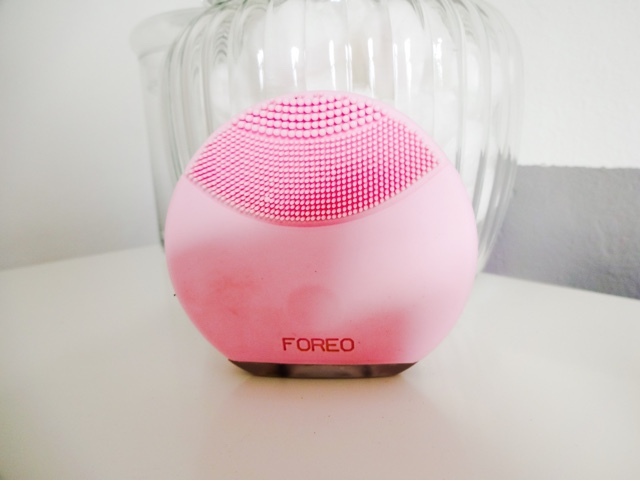 It uses sonic pulses to deep cleanse the skin – you just wet it and use it with any cleanser you like. As the whole thing is made of silicone, there are no bristles to harbour any bacteria, so its ideal for problem skin. I’ve been using it every day and night and I noticed that whenever I had a spot coming it stopped it in its tracks. It feels really nice to use and then your skin is very soft afterwards. I also feel like its helped with the fine lines on my forehead – they haven’t disappeared but they look softer – and using it in the morning takes down puffy eyes as it drains the fluid away. I’m really impressed! You just recharge it via USB and its so lightweight and easy to use. Since being pregnant I seem to be permanently dehydrated. I wake up thirsty and stay that way all day! So I’ve been making sure to carry this water bottle around with me at all times. Literally, it even comes with me to bed! 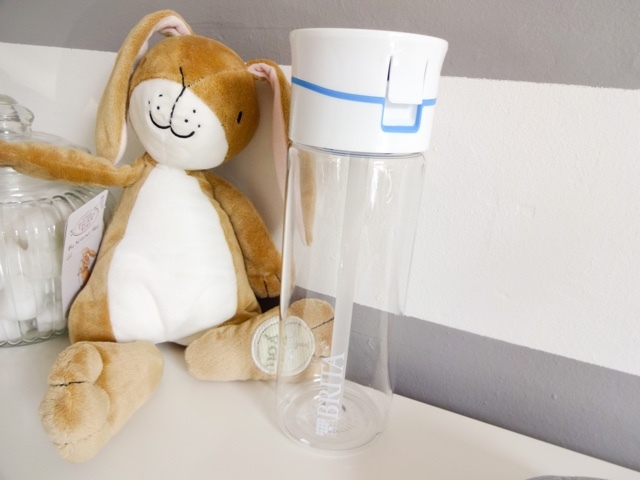 It has a small charcoal filter disc in the lid, which means you can fill it up from any tap and still get fresh filtered water. This is a lifesaver and has probably saved me a small fortune in bottled water, which is bad for your wallet and the environment! I like to add some lime segments to give it a little bit of flavour. Its been a complete life saver. Another weird pregnancy side effect for me has been really dry lips, so I depend on a good lip balm at the moment, and my absolute favourite has to be this Lip Butter from Royal Apothics. Not only is the little pot insanely cute, but the formula is very soothing and moisturising. 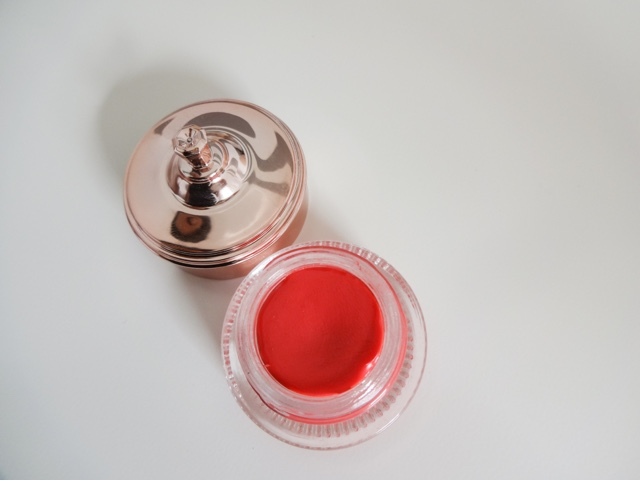 It also has a very subtle coral tint, which looks really pretty with light summer makeup. One thing I didn’t realise before I was expecting was how much I would hate maternity underwear! When you are expecting or feeding, you’re advised not to wear underwired bras because they can block the milk ducts. Of course I went out and got some maternity bras from M&S, that were just like the sort of crop tops you wear before you graduate to proper bras and I hated them. Specifically I hated the way they made me feel unsupported and saggy, and they gave a horrible silhouette under my clothes. Just because I’m expecting doesn’t mean I want to look terrible! So I was over the moon to find these bras from cotton soft. They use foam cups to give a soft support, and they look 100 times better than the first lot of maternity bras I had, which I’ve now binned. They unclip easily at the front so you can use them when you’re feeding as well. They are much closer to the type of bras I wore pre-pregnancy and they’ve made me feel a million times better. 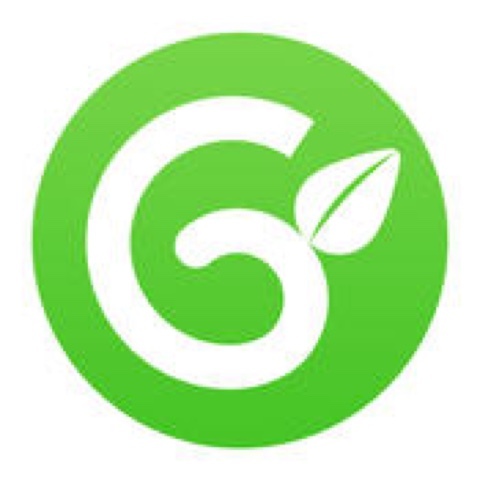 This app has been a constant companion ever since we found out we were expecting. It gives a record of your baby’s growth, using different fruits and vegetables, which for us frequently became a nickname for the baby (we went from ‘Olive’ when we first found out to ‘Coconut’ at the moment). 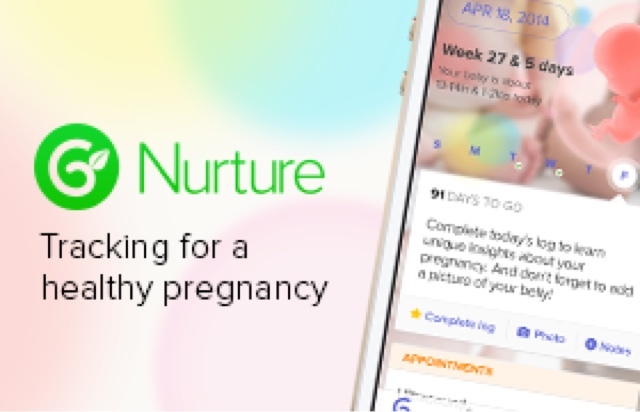 It also lets you chat with other mums to be, ask questions, keep a bump picture record, and gives really short ‘bite size’ information on your baby’s development and common health issues. You can also record your health and it will remind you to do important things, like kegel exercises or staying hydrated. It’s a stylish, easy to use interface as well. I’ve especially loved looking at it each week to see how much the baby has changed. It was especially important at the beginning to help me feel a connection with something I couldn’t even imagine at the time! Between being extra tired and sneaking in the odd afternoon nap and all the waking up in the night, you see a lot more of your bed when you’re pregnant. And one thing I’ve been enjoying to make my bedroom a nicer place is this relaxing room mist. 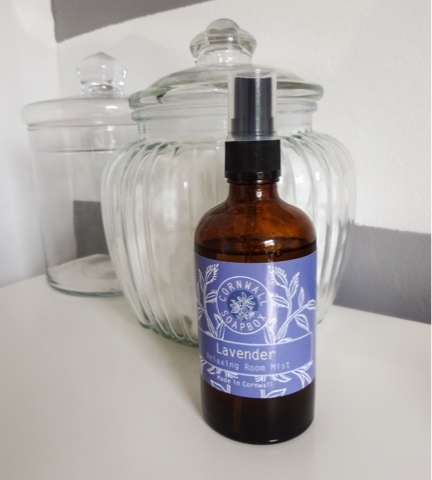 Lavender has a deeply calming effect on me, so if I’ve been feeling restless, or I’ve woken up all hot and bothered in the night with this humid weather, this spray has been a life saver. I pop some on my pillow or just mist it around the room and I feel so much better. This lives on my bedside table. This is the ultimate multi-tasker for mummies. There’s almost literally nothing you can’t do with a tub of this stuff – so much that I think I’m going to dedicate a separate post to its many uses. 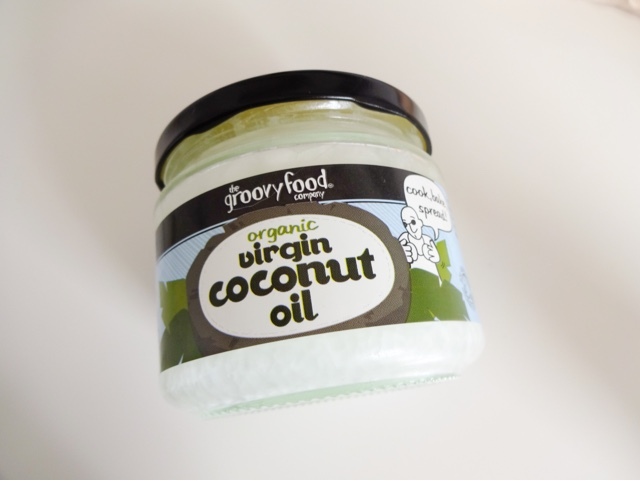 My favourite uses include as a hair mask and an intensive moisturiser for my dry feet, but it can also replace different mummy products like Lansinoh and Sudocrem – it does the job of all of those things as its anti-bacterial and all natural. I’ll never be without a jar of this now – I’m even taking a little pot of it into hospital with me. So those are my mummy-to-essentials that have made life easier over the past few months. What have you come to rely on? Any tips for products I should try?